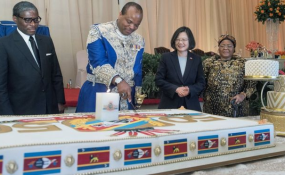 Editor Zweli Martin Dlamini is set to return to the tiny absolute monarchy of Swaziland. He had fled to neighbouring South Africa in January  after he had received death threats from a local businessman and his newspaper was shut down by the government, writes Kenworthy News Media. "My decision to return to Swaziland has been influenced by minor changes in the political landscape and the fact that two of the powerful people who wanted to kill me are now dead - businessman Victor Gamedze [who was murdered at a petrol station in Mbabane in January] and late Prime Minister Sibusiso Barnabas Dlamini", says Zweli Martin Dlamini, who is the editor of Swaziland News. I will not be going to Swaziland alone, but with an "influential member of the African National Congress", who has promised to accompany me to ensure my safety, Dlamini adds. In June 2017, Zweli Martin Dlamini had written and published a story about Swazi Mobile, a new telecommunications company that is owned by Swaziland's absolute monarch King Mswati III and was run by Victor Gamedze, for the paper he edited at the time, Swaziland Shopping. According to Dlamini's story, Mswati and Gamedze had forced Swaziland's government to side-line rival government parastatal company SPTC from competing with Swazi Mobile - a company that the Prime Minister Sibusiso Barnabas Dlamini owned shares in. "Shortly after publishing the story, I received a threatening call from Gamedze that lasted for twenty minutes where he vowed to 'deal with me'. Later, Communications Minister Dumsani Ndlangamandla summoned me to a meeting and told me that the King was not happy with the story and had ordered that the newspaper should be closed", Zweli Martin Dlamini told me in January. And although he believes that the situation is "not yet conductive for the media to operate freely", he does believe that the threats to his life have been reduced enough for him to be able to return to Swaziland. He cites the appointment of a new Prime Minister, whom he believes will respect media reform, as one reason for his decision. "But I am also going back to Swaziland while the world is shocked by the murder of Saudi Arabian journalist Jamal Khashoggi. I hope this will not happen to me", Dlamini says. Swaziland is ranked 152th of the 180 ranked nations in Reporters Without Borders' 2018 World Press Freedom Index, which mentions the ordeal of Zweli Martin Dlamini. "Swaziland is an absolute monarchy that prevents journalists from working freely and obstructs access to information", and there is therefore "no media freedom", the NGO concludes.